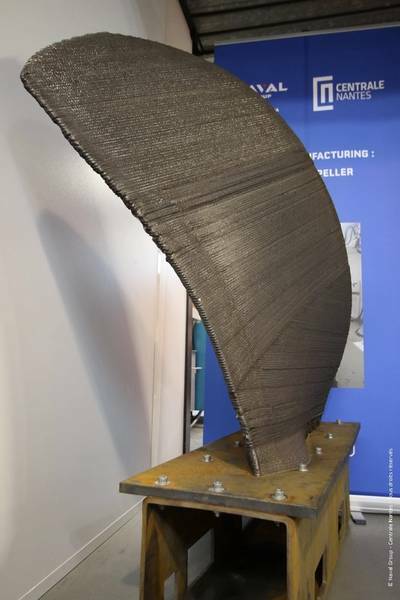 French defense contractor Naval Group and French elite engineering school Centrale Nantes have printed the first demonstrator of hollow propeller blades by metal additive manufacturing as part of the European H2020 project, RAMSSES. Naval Group, formerly known as DCNS, said that this collaborative program, funded by the European Commission, aims to reduce the environmental impact of ships. Centrale Nantes and Naval Group are taking the lead within this project on the production of innovative propeller demonstrators to improve the operational capabilities of ships. In order to improve vessel propulsion, Centrale Nantes and Naval Group are using additive manufacturing to design large parts (propellers of 6m in diameter), which could not be produced thus far using traditional manufacturing technologies. Implementing the Wire Arc for Additive Manufacturing (WAAM) process allows for the printing of large parts and paves the way for the production of propellers with more complex geometry. Reducing the environmental footprint linked to propulsion, as demonstrated in the H2020 RAMSSES project case study, is a challenge for all types of vessels, and particularly for large container ships.